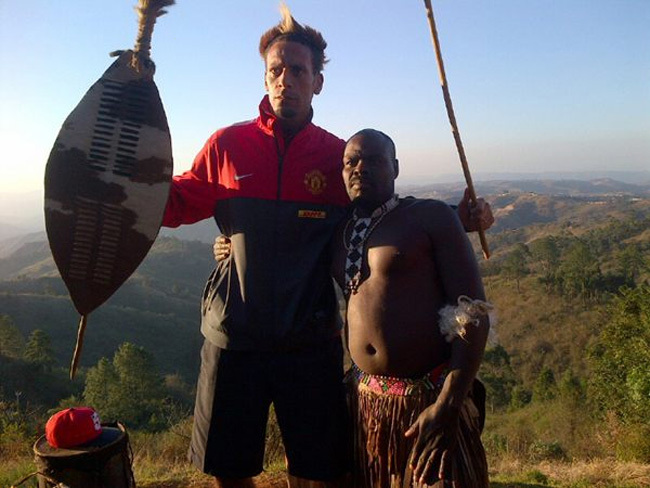 Snapshot: Rio Ferdinand Joins Zulu Nation, Claims To Have Killed A Lion And A ‘Wilder Beast’! Watch out Ashley Cole, Rio is on the hunt and he’s all tooled up! Taking a break from Man Utd’s pre-season tour of South Africa, Rio Ferdinand hooked up with some of the locals for a spot of hunting, apparently, or so he claimed on Twitter here…. Presumably he didn’t really kill the animals. Anyway, his new-look mohican may just catch on. Oh, and yes, it should be “Wildebeest”, not “Wilder beast”. So there. Rio is black, so it’s ok for him to do this. Rooney couldn’t do this. Could Ashley Cole do this? @AJM I know what you mean, but wilder beast and wildebeest are very, very different. Different amount of words even. If that’s not what you mean then please ignore me. After the Fortune comment, prepare to get prosecuted for racism!! I thought Lions were a protected species in SA? I do hope he gets what he deserves if what he has done is illegal…another classic Rio moment and publishing the fact on Twitter…idiot!!! You are a disgrace to yourself, your team, your country and to the human race. Surprised Sir Alex hasnt banned this idiot from twitter, not giving himself a great name, and Man U by association. Nice pic. No, he didn’t kill a lion, nor did he kill a wildebeest. It’s called a joke. As for the Quinton Fortune comment…. silly. Anyone can tell that it’s Benni McCarthy. he killed a wilder beast than a lion… a human?